Despite the title, this is neither a children’s movie, nor the story of a weekend’s alcoholic binge. It is semi-film noir about a man who comes to a town on the U.S.-Mexico border, looking to even the score with a crooked businessman who was responsible for a friend’s death. 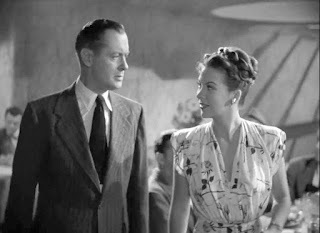 First of all, I must state that Robert Montgomery as a tough guy always stretches credibility for me. 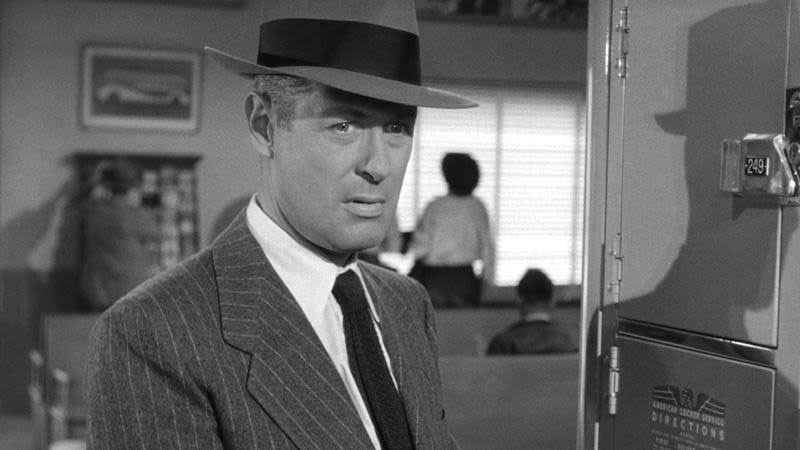 I think I’ve seen him in three or four films, and in all but one, he was a tough guy. There is something about him that does not convince me. This time, however, his acting ability - with which I have no problem, despite not being persuaded by periodic performances - and the subtlety of his direction win the day. 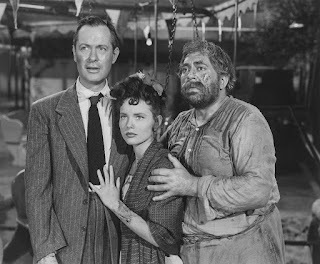 The story (script by Ben Hecht and Charles Lederer) is simple. There is blackmail, an attempt to thwart it by physical force, a femme fatale and a final showdown. The characters are intriguing, however. Montgomery’s is not the most interesting, despite his character’s name (‘Lucky’ Gagin) being displayed in the opening credits larger than the title, as if he is a famous character recurring in fiction (and his nickname is not, so far as I can recall, ever mentioned). In his quest simply to find a hotel room in a town crowded for ‘the fiesta’, Montgomery meets a disreputable-looking carousel-owner (Thomas Gomez). The new friend - an habitué of a bar - becomes very interested when the newcomer flashes his cash, but, despite expectations, the man proves a stalwart ally. 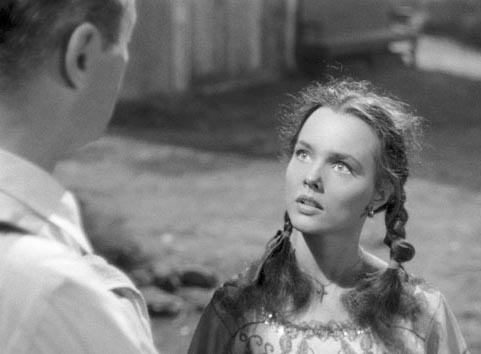 A girl (Wanda Hendrix), who is instantly attracted to Montgomery, has much to say on the relationship of the races, all without knowing she’s saying it. 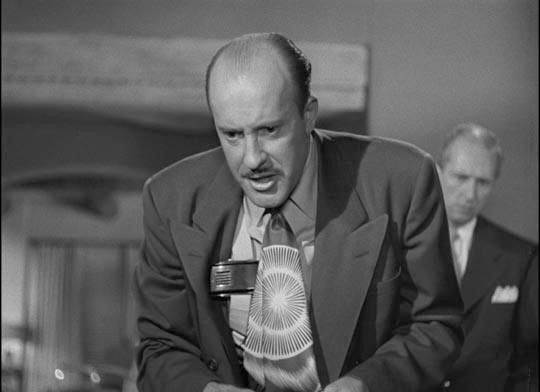 The action is mostly in the tension, the tension between Montgomery and others: the shady businessman (well-played by Fred Clark), Pila (Hendrix), the businessman’s sometime girlfriend (Andrea King) and the federal agent on the case (Art Smith). The climax occurs while one of the characters is delusional from an infected knife-wound; unlike many pictures, old and new, a stab in the back here doesn’t heal quickly and causes possibly deadly complications. 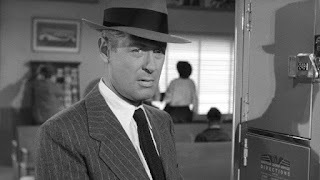 That Montgomery fits this role, despite my misgivings about some of its aspects, may be seen by imagining some more successful film tough guys in the part; Bogart or Cagney, for instance. They probably could not have given just the right nuance of vulnerability that was needed in the last twenty minutes. The ending is not what I expected it to be - I wasn’t really sure how Ride the Pink Horse would end, which I like in a movie - but is the logical conclusion of what had gone before. 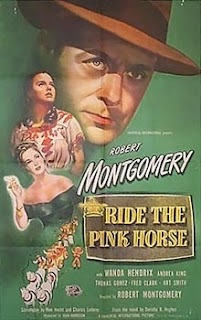 Ride the Pink Horse turns out to be a film that is good while one views it, but becomes better with more thought and consideration. It is not a classic, nor is it one that I will want to see again soon, but I am glad I saw it, and will recommend it to others. "Lucky" was the character's name in the original novel. I rather like that it was ignored in the movie. I picture the filmmakers watching the final product, taking a second look at the credits, and saying, "Oops, we forgot something..."
If his nickname was mentioned in the film at some point, it would probably have had to have had an explanatory conversation about it. I wonder if a scene was edited out of the finished film.